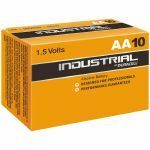 Notes: Duracell Industrial professional alkaline battery, made to the exacting specifications common to all Duracell batteries. 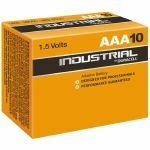 Notes: Duracell Industrial professional alkaline batteries. Notes: Duracell compact flashlight made with light, shock-proof and splash water protected aluminium of premium quality. The compact solution in a robust body. It is a small, handy, solid flashlight with a high light intensity, that fits perfectly into your pocket, handbags, satchels or glove boxes. Notes: Duracell Plus Power gives you reliable performance and long-lasting power in a broad range of everyday devices. 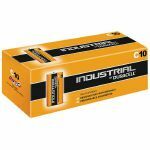 You can rely on Duracell Plus Power to power your remote controls, CD players, motorized toys, flashlights, toothbrushes, etc. Notes: A universal battery tester capable of testing most of the popular dry cell types under actual load conditions. Easy to read meter indicates battery condition at a glance. Tests PP3 (9V), AAA, AA, C, D, 4SR44 (6V), 1.5V button cells. Simple operation and sliding movement to fit various battery sizes. Supplied in a blister card. Notes: A handy, compact USB lamp with touch control, 3 brightness settings and a flexible goose-neck stem for ideal positioning. The USB connection makes it perfect to add extra light for home or travel. Notes: A stylish desktop lamp with touch control, 3 brightness settings and gooseneck stem for ideal positioning. The lamp can be powered by either USB or batteries making it perfect for reading and close work. Notes: This tough and lightweight LED headlight has an ABS body and features a high intensity 1W light beam along with 2 additional red LED'S for night vision and SOS function. Ideal for a wide range of indoor and outdoor activities especially night fishing, camping and climbing. Notes: Clip-on light featuring 2 independent goosenecks and individual switches. It is ideal for a wide range of uses including live performances, studio use, reading and crafts. Clip-on light featuring 2 independent goosenecks and individual switches. It is ideal for a wide range of uses including live performances, studio use, reading and crafts. 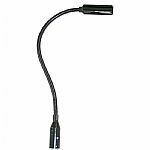 Notes: A lamp on a flexible gooseneck to illuminate mixers, turntables, 19" racks and other types of equipment. It is powered by the unit to which it is connected.